Everton have reportedly taken the lead over Southampton in the race to sign Arsenal outcast Theo Walcott in the January transfer window. According to a report by Daily Mail, Everton have moved ahead of Southampton in the race to sign Theo Walcott from Arsenal in January. Sam Allardyce has identified the Englishman as the player who would improve his side’s current attacking options going forward. Theo Walcott’s Arsenal career has come to a standstill under Arsene Wenger, as he continues to be ignored for Premier League games this season. The 28-year-old has fallen down in the pecking order, with the likes of Alex Iwobi and Danny Welbeck ahead of him in the first-team setup at the Emirates. Walcott, who despite having one of his best career campaigns in the 2016-17 season, in which he notched 19 goals in all competitions and was only outscored by Olivier Giroud and Alexis Sanchez, seems to have a bleak future with the Gunners, and he could move away from the Emirates this month. Arsenal are reportedly ready to let the player leave as well, despite Wenger’s comments declining the same, and he doesn’t seem to have a shortage of suitors. Walcott has been heavily linked with a return to boyhood club Southampton, who have now been joined by Everton in the race to sign him. A Southampton return might seem like a viable option for the pacy winger, but there are doubts about their ability to match or even come close to his current £110,000-a-week wages. Walcott, however, has his family in the South, although at this stage of his career, he could choose a more competitive club. Everton, backed by majority shareholder Farhad Moshiri, were able to spend big in the summer transfer market and are expected to strengthen in January as well. In particular, the Toffees are eager to strengthen attack, and Walcott is a viable target to bolster the wide areas. Everton seem to have the advantage over Southampton as they are more likely to match Walcott’s wages at Arsenal and this factor alone could swing the deal in their favour. 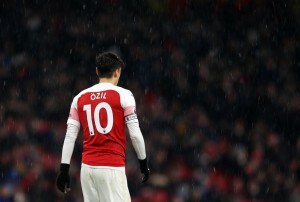 They are also capable, as a team, of mounting a challenge for the top six spots next season, and this again could tempt the player into swapping Arsenal for the Merseyside club. Walcott, at 28, still has plenty of football left in him, and at this stage of his career, is expected to choose a more competitive option as well as a club which would likely match his current Arsenal wages. Everton wouldn’t be bogged down by Arsenal’s reported £30 million asking price either, and a move could be on the cards. In the end, everything depends on Arsenal and their plans in the current window. Arsene Wenger, for now, has maintained that he would like to keep Walcott. If Alexis Sanchez departs for Manchester City, then Walcott might just end up staying. It now remains to be seen if Everton manage to sign the player or if he ends up staying.